The Tapir's Tale: Notes on "Your Brain at Work"
I just finished reading Your Brain at Work by David Rock and it is really good. If you haven't read it I can highly recommend it. 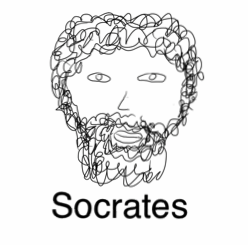 Since I think it is so full of good ideas, I decided I wanted to write down my understanding of it while it is fresh. I also recently finished reading Blah, Blah, Blah by Dan Roam and I'm going to use his Vivid style in this text. Our consciousness is located in an area of the brain called the Prefrontal Cortex (PFC). The Prefrontal Cortex main responsibilities are: recalling, memorizing, understanding, deciding, and inhibiting. 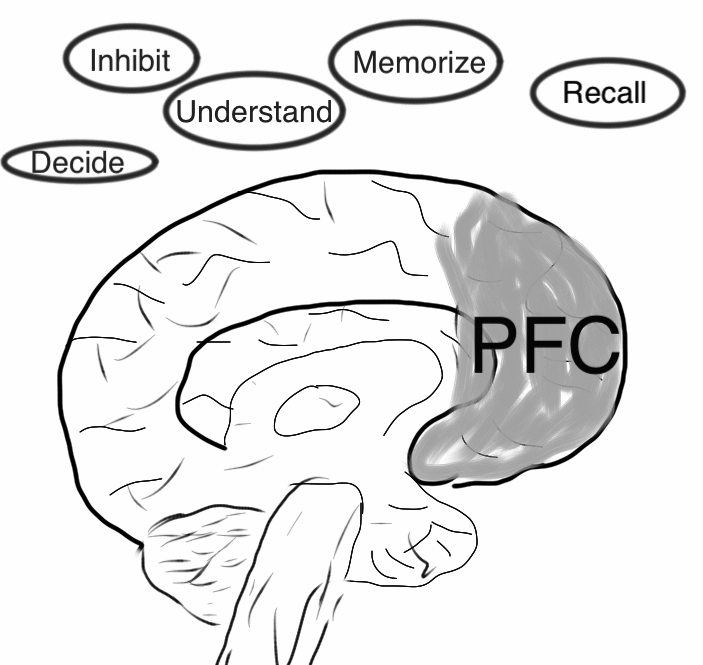 Recalling, getting information from long term memory into the PFC. Memorizing, storing information from the PFC into long term memory. Understanding, connecting new information to the information already stored inside our brain. Deciding, comparing two or more different items and deciding which one is most suitable. Inhibiting, preventing information from other parts of our brain and outside interferences from entering the PFC. Paying attention consumes energy and the brain has limited resources available. 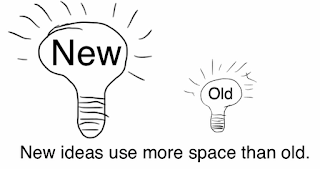 The more ideas we try to hold in our head at once the less attention we can pay to each of them. One especially energy consuming task is prioritizing, since it involves most of the ideas that the PFC has to do. In order to be able to prioritize well, we should do this when our minds are fresh. We need to prioritize prioritizing! 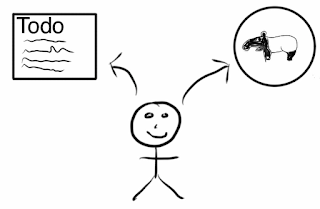 In the sixties George A. Milner, experimented with consciousness and came up with the idea that we are only able to hold 7±2 items in attention at once. The problem with this is that he probably overestimated our abilities. It is more likely that the number is less than four, and the less the better. The more information we can get our of our PFC, the better we will be able to focus on what is in it. Good ways to get things out of our PFC are: write them down or draw them. Visuals are especially good since our brain is very good at dealing with visual information and consumes less resources when dealing with visuals. Another important task to do to preserve resources is to inhibit low prioritized thoughts. Write them down so that they don't consume your resources any more. Tasks that are not well-defined consume a lot more energy than they are worth. When comparing items, the less items you need to compare the better. The optimal number of items to compare is two. And, it is important to get the ideas out of your head and onto paper, so that you don't have to try to remember the other things while you are debating the merits of one. 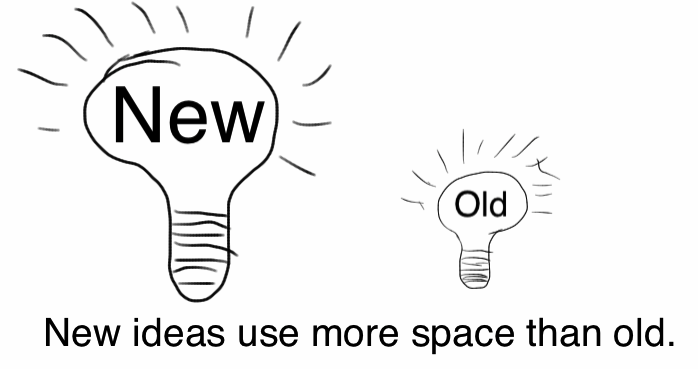 New ideas consume more energy than old, since old ideas are just references into long-term memory. Two techniques for limiting the amount of information you hold in you PFC are chunking and simplification. Chunking means grouping information into one chunk. It is easier to remember 1978 than to remember 1, 9, 7, 8. 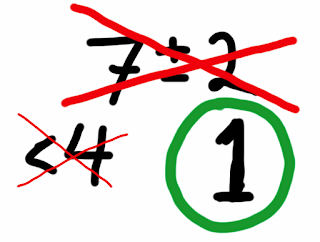 Simplification is a way of ignoring the complexity of something by just labeling it. Armed with this information it is easy to see that multi-tasking is a very bad idea. Dual-task interference happens when we try to do two or more things simultaneously. When this happens we loose precision. If accuracy is important don't divide your attention. If you do need to multi-task, here are some techniques that helps. Order things and only work from the front of the queue. Explicitly suspend-resume. Do one thing, stop, do another thing, stop, etc. It is a good idea to let others know that you are switching between tasks to let them know when you are paying attention or not. The brain is easily distracted. It has survived thousands of years by reacting to "a rustle in the bushes". In our modern world similar, external, distractions come in the form of mobile phones, email, twitter, colleagues, friends, family, etc. Avoiding distractions, inhibition, consumes energy, so, it is best to not let the distractions distract you in the first place. Along with external distractions we also have internal distractions, impulses. It is not as easy to turn off the internal distractions. To do this we need to practice self-control. But self-control is also a limited resource. When you have resisted one impulse, it gets harder to resist the next. Internal distractions are often triggered when we are thinking of ourselves. We can reduce the likelihood of internal distractions by clearing our mind before we set out on a new task. We can improve our mental breaking system by practicing, and re-enforce it by doing something physical along with the mental braking. 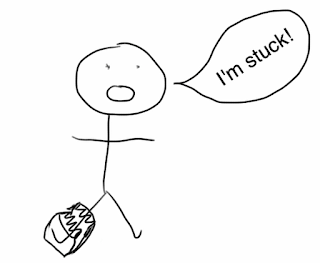 Getting stuck on a problem is called an impasse. To resolve an impasse, we need to let the brain idle. This gives the unconscious part of the brain a chance to solve the problem. To have insights involves hearing subtle signals and making loose connections. This requires a quiet mind with minimal electrical activity. Insights occur more frequently when you are relaxed and happy. Take a break, do something interesting. Focus on connections between information instead of details. Simplify problems into a very high-level description. In the brain we have two main networks: the narrative network and the direct experience network. The Narrative Network is the default network when nothing is happening. It keeps a conversation going in the mind. It makes assumptions and figures out plans from them. It is very sequential in the way it works. If I think of this, then this, then this, then this, etc., etc., etc. By just tuning in to this network, we make us very busy indeed. All the time. When we receive information through this network, it is filtered, and interpreted before we can do anything about it. The Direct Experience Network is our other main network. It is triggered when we let the brain idle, and just "listen" to what our senses tells us. This is often called mindfulness. This network is not sequential like the narrative is. It is immediate and it makes use of the full processing power of the brain and not just the pre-frontal cortex. The sensory information that is received through direct experience include information about the self, about thoughts, feelings, emotions, and internal states. When we need to get unstuck or unstressed, it is very wise to try to shift over to direct experience. This can be done by focusing on sensory information, such as how the chair feels on our buttocks, how the wind feels on our cheeks, or listening to the sound of birds singing or our own breath. This simple act will allow the brain to get unstuck of its previous ideas. The act is actually not that simple, it is not easy to focus on one thing for more than a few seconds. A part of working memory called the executive function "sits above" the other functions monitoring our thinking, choosing how to best allocate resources. Mindfulness is about living in the present and it gives us "the ability to pause before we react." When you are being mindful you are also noticing information about yourself. When you notice that you are not doing what you should, you are being mindful. You are noticing information about how and what you are thinking. You are noticing inner signals. Practice, you can be mindful anywhere and with anything. 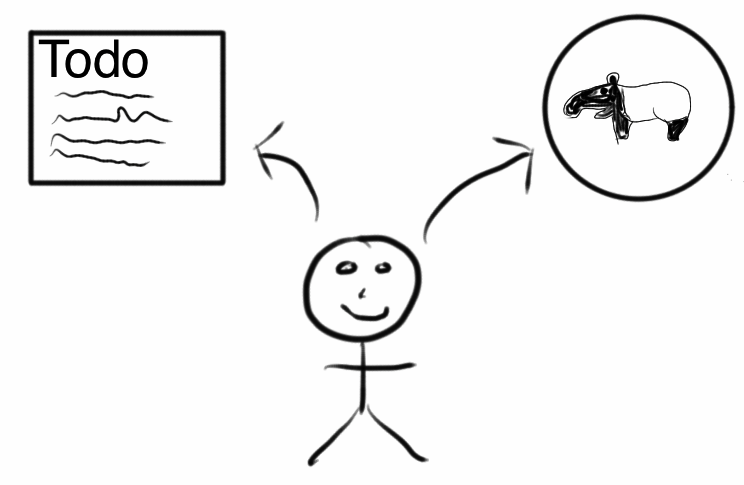 The brain tries to minimize danger (away response), and maximize rewards (toward response). The away response is stronger, faster and longer lasting than the toward response. The away response can reduce cognitive resources, making it harder to think about thinking, making you more defensive and mistakenly classify situations as threats. Trying to suppress an emotion often makes it worse and often makes other people feel uncomfortable. 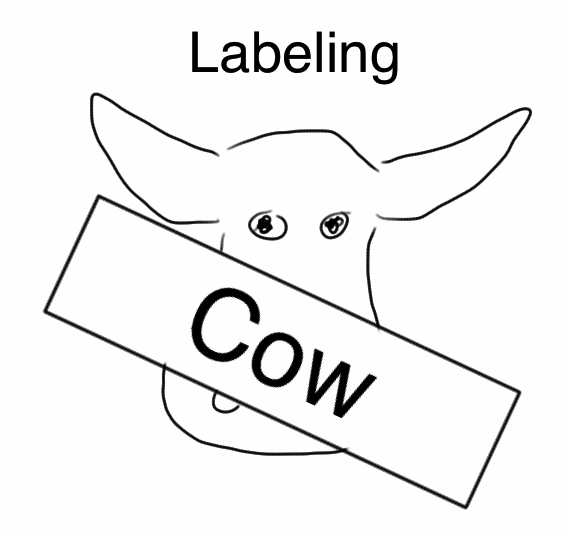 Labeling an emotion, giving it a name, often reduces the emotion. 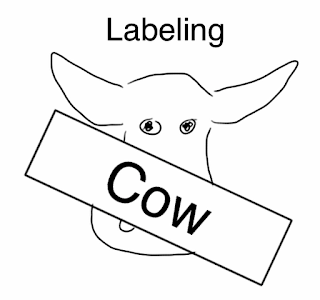 The label needs to be symbolic, short and succinct. Reappraisal is a powerful method for managing increased arousal. It means that you evaluate a situation and see it from a different perspective than you first do. 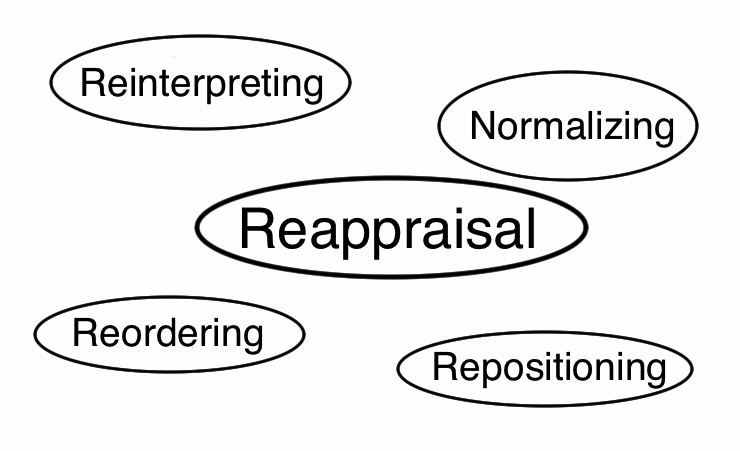 Four forms of reappraisal are: reinterpreting, normalizing, reordering, and repositioning. Reinterpreting is something we do every day. When we are late for an airplane, we feel worried and hurry our steps, to avoid missing the plane. When we can see the gate and the people waiting for the plane, we automatically reinterpret the situation since we see that we have plenty of time. Nothing has changed, except our interpretation of the situation. Reordering is a larger form of reappraisal. It involves changing the way we prioritize what is valuable to us. If we value two things, such as autonomy and responsibility, they may come in conflict. An example would be working as a member of a team where you are allowed to make independent decisions about how to do your work, allowing you to feel in control of the situation. When you are suddenly offered the job as team lead, you will lose control of the situation, since other people will be responsible for doing the work that you used to do. Your autonomy has decreased since you have to rely on other people to get the work done. You have to reappraise the situation, reorder your priorities, in order to be comfortable with this new situation. The last form of reappraisal, repositioning, involves putting yourself in someone else's position. In order to understand why they are reacting the way they do. If someone thinks all your ideas are worthless, they obviously don't see the world the way you do. In order to understand why they feel the way they do, you have to try to put yourself in their shoes. Perhaps they have tried the ideas, you are suggesting, and failed previously. The reason they don't want to you to try it may be in the best interest of everyone; they don't want the project to fail or, it may be simple jealousy; they don't want you to succeed with what they failed with before. I does not matter what the reason is. By putting yourself in their position you will be in a better position to deal with the arguments when they come. If you recognize that all interpretations of the world are just that, interpretations your brain has made, then, having a choice about which interpretation to choose at any moment makes more sense. People who reappraise more tend to live happier lives. One way to reappraise a situation is to think "It's not me, it's my brain!" 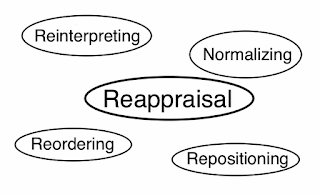 It is also worth noting that reappraisal uses a lot of energy and it is best done when the brain is fresh. But, reappraisal, like everything else, is something you can practice until it becomes habitual. Expectations are the brain paying attention to a possible reward or threat. Expectations alter the way you perceive the world. It is common to fit incoming data into expectations and to ignore data that don't fit. Met expectations generates a small increase of dopamine. Exceeded expectations generate a large increase of dopamine. And dopamine makes you feel good. Unmet expectations generates a large drop in dopamine level, and a strong threat response. The dynamics of expectations can generate upward and downward spirals. A general feeling of expecting good things generate healthy levels of dopamine and may be the neurochemical marker of feeling happy. If your expectations are not met, try reappraising, remembering that it is your brain reacting to the dopamine levels. Maslow's hierarchy of needs may have been wrong and other needs may be as important as the primary needs that he identified. Social connections are a primary need, as vital as food and water. We know other people by experiencing their states ourselves. Safe connections with others are vital for health and for healthy collaboration. People are classified as friend or foe quickly. Foe is the default. You need to work hard at creating connections to create good collaboration. Connect to people on a human level, by sharing experiences, to create better collaboration. In order to collaborate well with others it is a good idea to take into account the major areas that we care about socially. 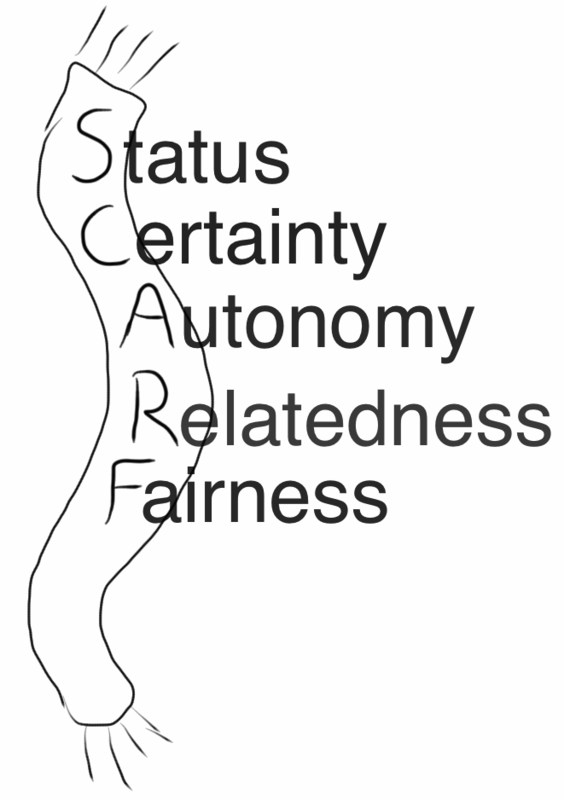 The can be summarized by the SCARF model, SCARF stands for Status, Certainty, Autonomy, Relatedness and Fairness. Status, is a significant driver at work and across life experiences. Status changes affect our threat and reward circuits. People pay a lot of attention to building and protecting their status. When everyone is trying to achieve higher status, there is a decrease in relatedness. Playing against yourself increases your status without threatening others. You can decrease the status threat in others, by sharing your humanity or mistakes. Certainty is when you feel sure about yourself, your environment, and the people around you. Autonomy, the feeling of control, is another primary reward. Note that is the feeling of autonomy that is important, not the actual autonomy. The feeling of autonomy can be increased by letting people understand that they have choices. Relatedness is the feeling of being part of something. The feeling of being part of a team or of a cause. The feeling to belong. Fairness, can be a very strong drive indeed. People go to war in order to make a wrong right. Treating people fairly may increase several of the other primary social domains. Trying to solve problems is less effective than trying to find solutions. When solving problems we narrow in on a specific area rather than trying to creatively find a solution that we are really looking for. When helping others to solve problems, it is often not helpful to suggest possible solutions. People don't want to be fed a solution that they are not buying into. Threatens the status, since it implies that they are incompetent. Threatens the autonomy, since they cannot come up with their own solution. Threatens the relatedness, since it is harder to relate to someone else's solutions than to your own. It is better to bring people to their own insights. To do this it can be helpful to ask questions that make them think about their own thinking or to think of the problem at a very high level. Some ways to do this is to ask questions about what strategies people have been thinking about for solving the problem or to ask them to summarize the problem in one sentence. The brain constantly changes itself. This is called neuroplasticity. Focused attention changes the brain. Attention is lost very quickly if we feel threatened by something. To induce change try to move attention away from the perceived threat by posing good questions. Creating long-term change requires paying attention regularly to deepen the new circuits. Don't try to influence people in a strong away state. 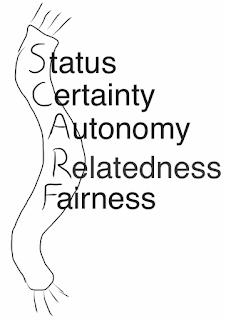 Use elements of the SCARF model to shift people into a toward state. Practice using solution-focused questions that focus people's attention on the specific circuits you want to bring to life. Invent ways to have people pay repeated attention to new circuits. Your Brain at Work is as you may tell from my notes not only about the brain at work. It is about the brain. It is a really good book and I highly recommend it to everyone! Great thanks for this post, and also the previous one! I got a lot out of reading them, and, perhaps most importantly, this one got me to get the book. I just read the first "scene" in the bathtub, and I soon had to get up and get a notebook to write down the ideas that popped into my mind based on the new insights I was getting. I also realized one thing that I got wrong from your post: the advice to do something physical to get a mental break. It's not the first time I have heard this, and I have tried it many times. I now realize why many times it hasnt't worked at all. The scenario is that I am, usually, at my desk, feeling mentally exhausted after thinking hard abaout something, and needing a break. Then, sometimes I have "done something physical" like took a walk in the stairs, down and back up to the floor, and sat down at my desk again, not feeling any less mentally exhausted at all, rather the reverse. 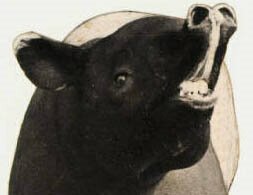 Of course, I now realize, because the mental exhaustion has in fact been physical: by thinking hard, I have exhausted the glucose in my blood. By walking in the stairs, I just used up even more clucose! Physical that uses up energy is supposed to be used for another, longer, kind of breaks, to help against another kind of exhaustion. That was just an example from what I learned from the first fourteen pages. @avadeaux, I'm glad you liked the posts. I'd love to hear your thoughts on the book when you have read it. It really helps to jot down notes or draw things so we cannot forget important details that are needed to be remember. Saw a discussion of National Geographic on how our brain works, and surprisingly, we have a lot of not permanent memories. They are just recalled images which we associate with. Now I know why a lot of us say "Isn't this deja vu?" @Philip, Interesting, any links to where I can find more information?